Smoothies are not really known for being low carb since they are usually made with banana and other high carb ingredients. However, with a little creativity and some smart tricks, it is definitely possible to make delicious low carb smoothies that are a convenient way to get your nutrients in. As the base for your low carb smoothies you can use avocado, silken tofu, vegan yoghurt, vegan milk, nut butters, or a combination of these. You can optionally add low carb fruit, veggies, oil and protein powder to boost the nutritional value. For a nice fruity flavor without going over your carb allowance, sugar free fruit flavored syrup is a good option. Cocoa powder also works great for flavoring, especially in combination with nut butters. Or you can go with spices and herbs like cinnamon, ginger or mint. 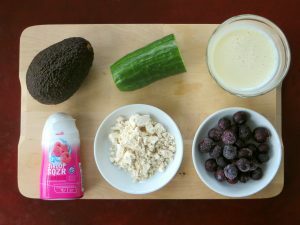 You'd never guess from the color or taste, but the smoothie in the picture was actually made largely from avocado and cucumber with some berries, protein powder, soy milk and syrup. It was super filling too! 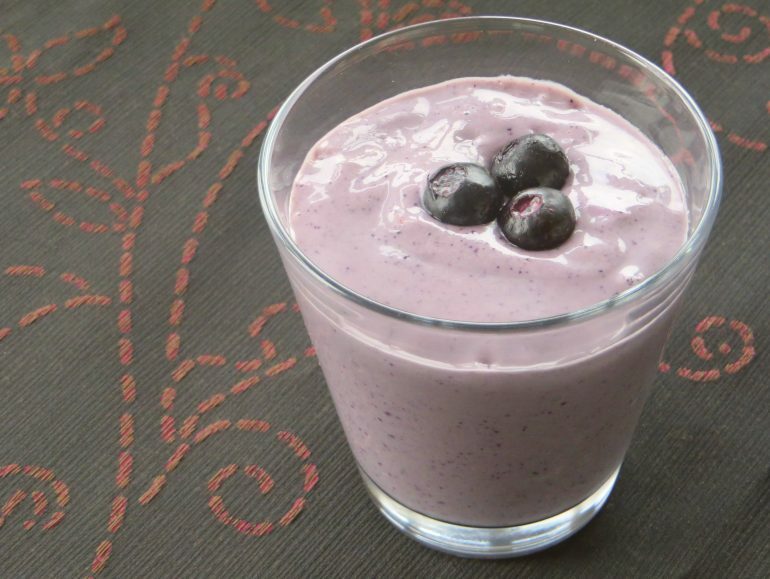 With the berries, this recipe has 10 gram net carbs, without them it's about 4-5 gram. Add all the ingredients to the jar of your blender and blend until smooth. Taste and add a bit more fruit flavored syrup if you like. You can also play around with the amount of milk to make a thin drinkable smoothie or a thicker substance that works well in smoothie bowls. Is the cucumber/celery for sodium? Hi Brenda, the cucumber/celery is mostly there as filler to give volume and substance to the smoothie because I don't want to use a lot of fruit. It also contributes a subtle 'green' flavor that I like. It doesn't have a whole lot of sodium. I get plenty of sodium from other sources such as soups and salted nuts, so I am not focused on the sodium content of my smoothies. What would be a good vegan protein powder not soy for smoothie...are there smoothies for cleansing? Hi Marilyn, any type of vegan protein powder you like will work fine. I'm a firm believer that your body does a fine job cleansing itself, especially if you just eat a normal healthy diet. No special drinks needed.